The E5B beam line of the RRC is dedicated to biological irradiation. Various kinds of biological samples such as plants, animals and cells are irradiated in atmosphere with heavy ion beam of C, N, Ne, Ar or Fe. The beam line, as shown below, has a pair of wobbler magnets coupled with a gold-foil scatterer, a beam monitoring system, a collimator and a range shifter. 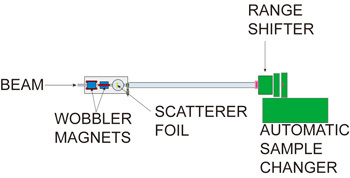 The combination of the wobbler magnets and the scatterer realizes a large irradiation field with a homogeneous dose distribution. The graph below shows a lateral distribution of the beam intensity measured for 135 MerV/u Ne ions at the position of the sample. 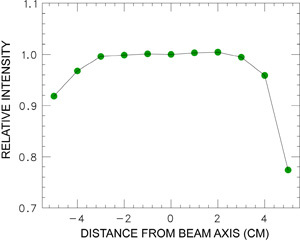 The variation of the beam intensity in a 8-cm-diameter circle is within 5%. An automatic sample irradiation system is installed at the end of the beam line. More than 500 sample containers filled with biological samples can be irradiated in atmosphere. For each sample, the linear energy transfer (LET) can be selected by the range shifter. 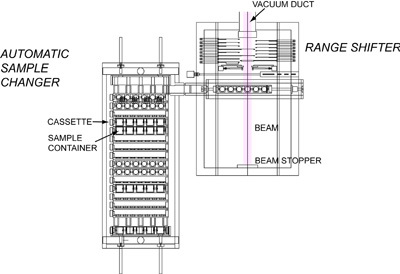 An automatic sample changer places the sample containers in a cassette at the beam position successively and the sample is irradiated at a given beam dose and LET according to a program. 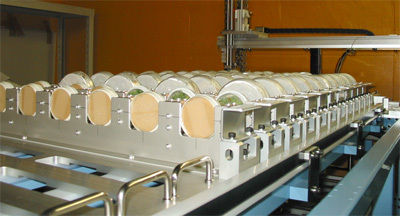 A top view of the automatic irradiation system and a photograph of sample containers in cassettes are shown below. Top view of the automatic irradiation system. H. Ryuto, T. Abe, N. Fukunishi, M. Kase and Y. Yano: “Heavy-ion beam irradiation system for biological samples in RIKEN”, Journal of Biomedical Nanotechnology, Vol. 2, p. 88-93 (2006).